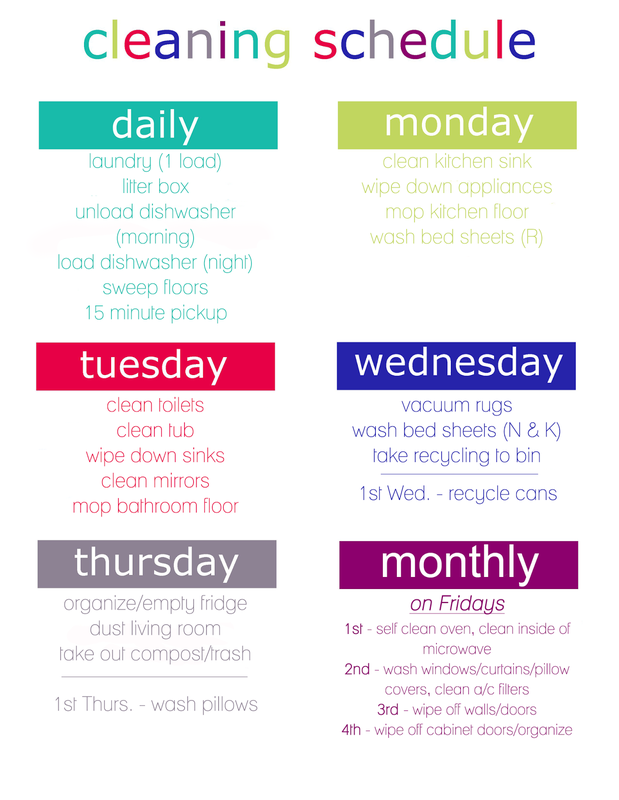 Cleaning Schedule Printable - Nekaro & Co.
With school starting back last week and my youngest beginning preschool next week, I thought I would revisit and share my weekly/monthly cleaning schedule with you guys. 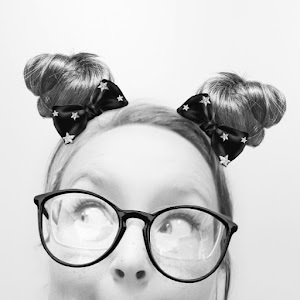 I didn't realize until I decided to write this post that nearly exactly a year ago, I wrote the first post about my new schedule! My current one has been changed slightly from that original schedule. I have dropped the ball on keeping to the schedule during the Summer months. Things have fallen apart. Laundry builds up quickly in our house with five people. Dishes? Ugh. Sinks overflow after just one missed washing. Having a visual checklist every day really helps me to keep up with every day chores. It also helps to break it up over the whole week and I really only spend about an hour every day doing the daily items. Laundry, of course, is the most time consuming, but because I try to do at least one load every day, I'm not spending all day Saturday or Sunday just doing laundry. Download a blank version here. Did you know that Good Housekeeping recommends only washing your towels every 3-4 uses? I had no idea. I wash them all after just one use. I'm just not sure I can get on board with using a towel for a week before washing. I still wash the bed sheets once a week, but they also say you only have to do that every other week. 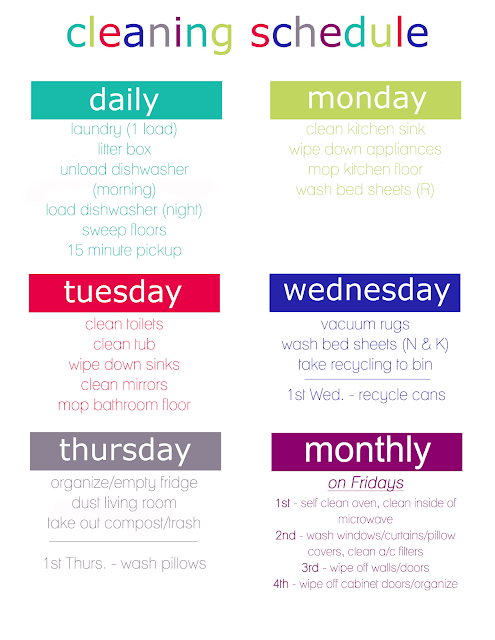 Do you use a schedule to keep up with all the cleaning in your home? Thank you Pam Tucker! I'm glad you can use it! I'm not sure what happened to your original comment, but that's for stopping by!